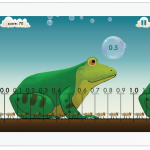 In this game, youngsters begin by simply matching the number superimposed on their guppy with a floating bubble containing the same number of dots; the fish can’t eat the bubble unless the numbers are the same. Things get more complicated, though, as bubbles containing different numbers of dots begin to appear. Children can use a finger to combine bubbles to obtain the right quantity of dots. For example, to feed a guppy with a 6 on it, they can drag together bubbles containing two dots and four dots, and bubbles containing three and three. Because of its interactive nature, the game does a nice job of helping children pair quantities with numeric symbols. These games are appropriate for all ages; any child old enough to appreciate the concepts of addition and multiplication can play and benefit from them. 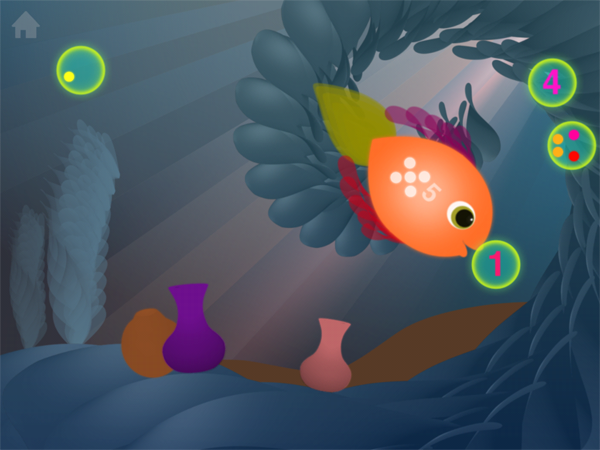 In Hungry Fish, players must add the numbers in floating bubbles to attain the number displayed on their fish. (Unlike Hungry Guppy, players see numbers and not dots.) Wings teaches multiplication with an innovative combination of numbers displayed in various formats, including numerals, rows of dots, clusters of dots, and groups of dots so that students can use their visual skills to appreciate how multiplication works. An understanding of the number line is critical to math. And even students who are comfortable with the number line when it shows whole numbers can have a hard time appreciating amounts when they’re shown as fractions and decimals. Both of these games allow students to practice these important concepts in interesting ways. Motion Math Zoom, best for children in first through fourth grades, asks players to place a number on a number line. Whole numbers are represented by frogs, and decimals are represented by ants to indicate that they are smaller. Ten ants are lined up on the ground next to each frog, and players must zoom in and out as they scroll along the line to place the numbers correctly. 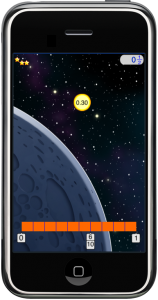 Motion Math HD, meant for learners who are ready for instruction in fractions, deals solely in fractions and decimals and requires players to tilt their iDevice back and forth to move the number around the screen. The goal is to get it to bounce down on the right part of a section of number line that goes from 0 to 1. Not only are both games fun, they provide an important bridge between appreciation of quantities and the symbols that represent them. All of these great iOS games are available through the iTunes store. Prices vary according to whether the game is downloaded onto an iPhone or an iPad, but some are free and all are inexpensive. *Gabriel, F., et. al. (2012). Developing Children’s Understanding of Fractions: An Intervention Study. International Mind, Brain, and Education Society, 6(3); and Blackwell Publishing, Inc.
Sasanguie, D., Van den Bussche, E., & Reynvoet, B. (2012) Predictors for Mathematics Achievement? Evidence from a Longitudinal Study. International Mind, Brain, and Education Society, 6(3); and Blackwell Publishing, Inc.
Vanbinst, K., Ghesquiere, P., & de Smedt, D.(2012). Numerical Magnitude Representation and individual Differences in Children’s Arithmetic Strategy Use. International Mind, Brain, and Education Society, 6(3); and Blackwell Publishing, Inc.